for their dedicated community work. 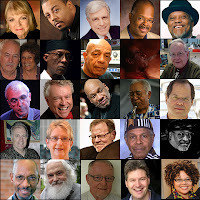 Today the Jazz Journalists Association kicks off both JazzApril --a month long celebration of all things jazz-- and the 2013 JJA Jazz Awards season by announcing this years Awards' finalist nominees along with the names of this year's JJA Jazz Heroes, cited for their exemplary work in keeping jazz alive and well in their communities. The final-round nominees in 37 categories of jazz musicianship, recording, media and journalism were the most-often named by JJA Professional Journalist members during first round voting in February and March The full list is posted on the 2013 Nominees page on this site. Winners of the music awards will be announced here on jjajazzawards.org on May 1. The winners in media/journalism categories will be announced at the JJA Media Awards party, a ticketed event scheduled for June 19 at the Blue Note Jazz Club in New York City. This year's twenty-five Jazz Heroes --the complete list is on the Jazz Heroes page-- were named on the basis of nominations from their home communities, in consultation with the JJA. They represent a wide range of contributions to their local jazz communities, as well as the national and international jazz world: among the group are musicians, educators, presenters and businesspeople. What they all have in common is their dedication to local efforts that nurture the spirit of jazz and ensure its transmission to new generations of jazz lovers. Most of Jazz Heroes will be celebrated and receive their awards at "satellite" parties hosted by local jazz organizations or groups of enthusiasts. This year, many of the parties have been scheduled during April to better highlight the fact that "April is Jazz Month"